Harcourts franchise owners in each state nominate and support the organisations that impact the community. Additionally, Harcourts corporate team members who salary sacrifice to the Foundation are given the chance to nominate a specific charity for a grant as part of an initiative called ‘corporate choice grants’, while the Landmark Harcourts network also designates grant recipients. Harcourts Australia held its 5th annual “Walk a Mile in Their Shoes” nationwide fundraiser on 1st September 2017. 100% of funds raised will be used in White Ribbon’s “Breaking the Silence” respectful relationships programme in primary and secondary schools across Australia, aimed at creating generational change in attitudes towards violence. Since 1970, The Shepherd Centre for Deaf Children’s early intervention programs have enabled thousands of children with hearing loss to learn to listen and speak. TSC is recognised as a world leader in the field of Auditory-Verbal Therapy (AVT), and they treat children directly and provide parents with the strategies and methods they need to teach their children to learn to listen, speak and communicate verbally. This grant will support their “Reach out, Connect and Communicate”- a teleintervention project to reach out to deaf children in rural Australia and Tasmania. The aim of the project is to support deaf children connect to their services, no matter how far away they live, to develop speech and language and thus reach their full potential. 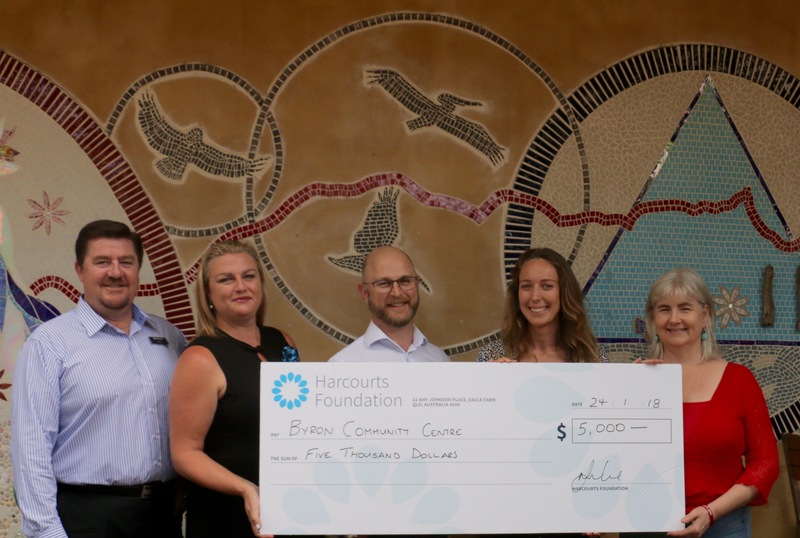 The Byron Community Centre (BCC) has been operating as a social enterprise for 35 years and delivers a range of community services and activities that are attentive to the needs and strengths of the people, families and communities of Byron Bay. Through the provision of temporary shelter during extreme weather events (EWE’s) their Wet Weather Shelter Project – Keeping Them Safe – is responding to the needs of people sleeping rough in extreme weather in Byron Bay. With the second highest number of rough sleepers in NSW (ABS 2016), homelessness is an increasing issue in Byron Bay. The project involves the activation of two emergency shelters (gender divided) in central locations in Byron Bay; The Byron Uniting Church and Anglican Church. This project aims to alleviate the physical and psychological impacts of EWE’s on rough sleepers in Byron Bay and increase the capacity of under-pressure community service providers in the region. The Hut provides a range of programs and services that enhance the wellbeing of Adelaide Hills residents through Education & Training including accredited ACE courses and non-accredited courses, Healthy Living activities, courses and workshops. Their support services including transport for shopping, social outings, 1:1 social support and personal transport for medical appointments all enable older people to stay in their own homes for longer. The Hut Community Centre officially opened the doors of The Community Shed in March 2016, with an average of 10 members attending twice per week. Shed members are motivated to attend for a range of reasons; many initially approach the shed as they have projects they wish to complete but find that the social connections they have made are having a positive impact on their lives and become very important. This grant will be used toward the purchase of a storage shed, including shelving and concrete floor, to improve storage and access for the Community Shed. Ronald McDonald House Adelaide provides accommodation and practical assistance to approximately 350 families each year who live further than 100kms from Adelaide, with seriously ill or injured children who are being treated at nearby Women’s and Children’s Hospital. With the house built in 2000, most of their bathrooms are nearly 18 years old and are in desperate need of refurbishment. The grant will be used to cover the plumbing component of the bathroom renovations. The Childhood Cancer Association is South Australia’s key childhood cancer support association providing hands on support to over 400 children with cancer and their families. In 2016 in South Australia, 49 children were newly diagnosed with cancer (nearly one child a week), 7 children relapsed and sadly 9 passed away. The Childhood Cancer Association believes families deserve the best possible care and support, so they don’t face their cancer journey alone, and provide a range of 30 services to support them. Harcourts Packham auctioned the chance to shave Troy Sgarbossa’s head to supplement their Quiz Night fundraising (over $10,000 last grant round) toward “Bradley’s Place” – a respite accommodation for families to take a break away from the demands of the hospital, or as a safe and comfortable space for families with children receiving palliative care treatment to create some lifelong special memories together. Since Bradley’s Place was established, they have provided more than 600 families with the opportunity to escape to Bradley’s Place for essential respite. St Vincent de Paul Society Queensland supports the most disadvantaged and underprivileged people in our community. Their Vinnies CEO Sleepout supporters raised over $5.6m for people in Australia experiencing homelessness in 2017. This event is an important meeting of minds, designed to focus the energy of business and community leaders on raising vital funds and awareness for people experiencing hardship, with funds used towards realising housing solutions for the 105,000 Australians experiencing homelessness and disadvantage in Australia. Funds were raised via Harcourts Queensland Foundation Ambassador Sam Hinshelwood’s “Project One” event, where Sam provided a “soup kitchen” lunch to Harcourts Australia corporate team and asked for a donation of “one day’s rent/mortgage”. Soap Aid’s mission is to save children’s lives through improved hygiene whilst positively impacting the environment. Soap Aid stops waste soap from going to landfill by collecting it from hotels and recycling it into new clean soap which they then distribute to target communities within Australia and developing countries. Soap Aid is the only organisation in Australia that undertakes the collection and recycling of discarded soap. The distribution of free clean soap is accompanied by education campaigns to promote hand washing and better hygiene. To date Soap Aid has recycled 761,136 bars of waste soap thus redirecting more than 70 tonnes of waste from landfill. This has resulted in the distribution of free soap to remote Indigenous communities in Western Australia and NT, and communities in Cambodia, India, Philippines, Fiji, Vanuatu, Indonesia and Africa where poor hygiene contributes to the spread of preventable diseases such as trachoma (eye disease), pneumonia and diarrhoea. This grant will be used toward creating a three-minute training video about Soap Aid to help bring more hotels on board as partners. Retreat for Kids / Sanctuary for Women and Children offers temporary accommodation for victims of domestic violence and or homelessness on the Gold Coast. At least 15 women per day are left with no accommodation options due to lack of support for this cause on the Gold Coast, and they require funding to increase the capacity of the refuge to cater for more victims. This grant is a valued contribution to the completion of the last family unit in the complex.